Painting Circles addresses the changing professional milieu of artists in early 20th century Japan, particularly the development of new social roles and networks, and how these factors informed the development of artistic identity. The focus of the study is the Nihonga painter Tsuchida Bakusen (1887–1936), who in 1918 founded an exhibition collective, the Kokuga Society, in response to increasing dissatisfaction with the nation’s government-sponsored exhibition salon. 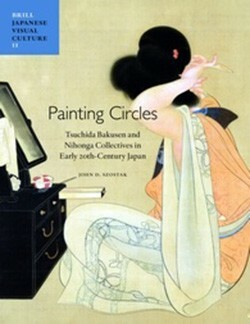 The study examines efforts by Bakusen and company to establish an independent position vis-à-vis the arts establishment by demonstrating their reflexive knowledge of Western modernist art movements on the one hand, and on the other, by showing their deep commitment to preserving traditional Japanese painting themes, media and techniques into the 20th century. John D. Szostak is Associate Professor of Japanese Art History at the University of Hawaii at Manoa. He received his B.A. from Colgate University, and earned his M.A. and Ph.D. degrees from the University of Washington. He undertook his doctoral research as a Fulbright Fellow at Kyoto University, and completed his Ph.D. on the Kokuga Society and Kyoto Nihonga in 2005. He taught Japanese art history at the University of Washington and at the University of British Columbia before coming to the University of Hawaii in 2006. His primary research interests are in the history of Japanese neotraditional painting (Nihonga) of the late 19th and early 20th century, and more broadly, in changing attitudes towards traditional Japanese arts and aesthetics in the modern and post-modern periods. He is currently involved in a translation project entitled “Art Sources and Documents of the Meiji, Taishō and early Showa Era (1860s-1940s)” and a book-length study of modernist Buddhist painting of Japan.